In Houses of the Interpreter, David Lyle Jeffrey explores the terrain of the cultural history of biblical interpretation. But Jeffrey does not merely rest content to chart biblical scholarship and how it has both influenced and been influenced by culture. Instead, he chooses to focus upon the "art" of Biblical interpretation--how sculptors, musicians, poets, novelists, and painters have "read" the Bible. By so doing, Jeffrey clearly demonstrates that such cultural interpretation has deepened the church's understanding of the Bible as Scripture and that, remarkably, this cultural reading has contributed to theology and the practice of faith. Jeffrey's chapters effectively root the theological issues central to any hermeneutical enterprise (e.g., Scriptural authority, narrative, the Old Testament as Christian Scripture, the role of the reader, gender, and postmodernism) in specific authors and artists (e.g., Chaucer, Bosch, Sir Orfeo, C. S. Lewis)--and he does this in constant conversation with literature, both eastern and western. 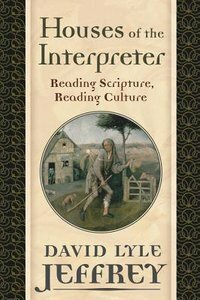 About "Houses of the Interpreter: Reading Scripture, Reading Culture"
David Lyle Jeffrey (Ph.D., Princeton Theological Seminary) is Distinguished Professor of Literature and the Humanities at Baylor University in Waco, Texas. He served Baylor as Provost, Senior Vice Provost and as Distinguished Professor of Literature and Humanities. 1. How Firm A Foundation...?